I missed out on the original LocoRoco, but I'm at a loss now. I'm told the original isn't as good as LocoRoco 2. For $20 though, it's really not that big a gamble. Regardless, here's my LocoRoco 2 review with pics taken by yours truly using the in-game camera tool. 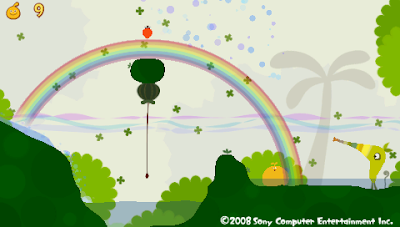 In 2006, a little celebrated title known as LocoRoco tumbled onto Sony's Playstation Portable with a tiny amount of fanfare. A Playstation 3 spin-off aside, it's been a little under three years since the original rolled its way into many PSP owners' hearts, and now a sequel, LocoRoco 2 skids into retail. 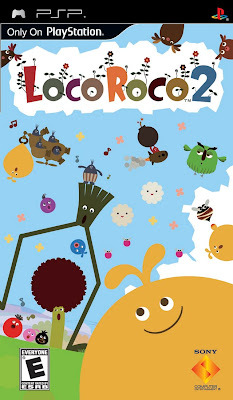 For those who have played the original, is there enough to warrant this sequel, and for the prospective newcomers, will they want to roll over to LocoRoco 2? The LocoRoco are a species of small, amorphous blobs with a passion for singing. Like Heinz ketchup, they come in many varieties. Each color, whether it be yellow, red, black, blue, green, pink, or newcomer purple, has their own theme song and personality. However, this is merely for show as no color is better for a level than another, so there's no advantage from choosing, say, a yellow LocoRoco over a black. As much as the LocoRoco would love to sing and play all day after eliminating the evil Moja army in the original game, the funkalicious foes are back with a vengeance, and once again it's up to the LocoRoco to clean up the black fog polluting the many areas of their once peaceful planet. LocoRoco 2 plays very much like the first entry of the series, so those who mastered the first game will tilt and tumble with the best of them. Even those new to the series will be able to hop right in with the immediately accessible and addicting gameplay. Rather than use the face buttons, LocoRoco 2 relies on the shoulder buttons of the PSP to tilt the playing field to roll the LocoRoco one way or another. Hit both buttons at the same time, and you jut the level upward to send your beautiful blob into the air-- simulating a jump. Don't be fooled, however. There's plenty more complexity found in these simplistic controls. 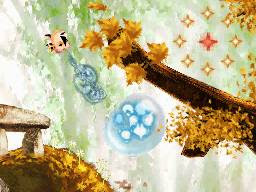 You'll see your collection of LocoRoco swing from vine to vine, enter inside a shell and roll through otherwise indestructible boulders, bounce across pinball-like platforms, hang from a floating dandelion as it slowly falls, and for the first time in the series, plunder the ocean depths with a little aerobic swimming. Certain parts will call for you to call your ball of LocoRoco apart so your team of colorful creatures can fit through narrow passageways. With a hold of a button, they can reform into one LocoRoco blob. The controls are simple, but some sections will make you want to have something more precise to use than simply sliding around. Overall, however, the set-up is remarkably intuitive and a breeze to use more often than not. There's plenty of level types. 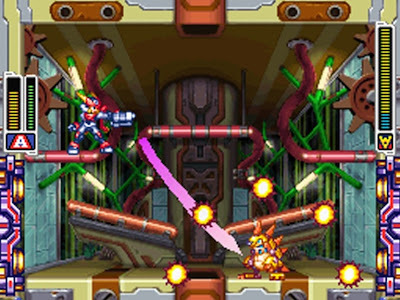 There are over twenty single-player levels to complete. Each has its own theme from icy slopes to lush jungles to tropical waters with appropriate enemies and obstacles to avoid and use. If you just want to breeze through the game as fast as possible, you can do so in about four hours. It's perfect for a rental in that regard. However, you'll entirely miss out on all of the secrets including alternate level paths, bonus levels, and the real final boss of the game, so there's where the "you might want to buy this game instead" line comes in. 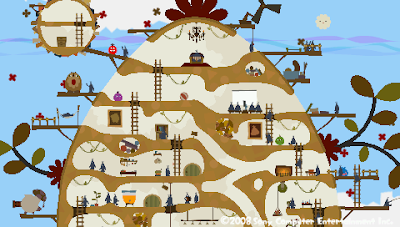 Each level has 19 red fruit for your LocoRoco ball to gobble up. The biggest challenge of LocoRoco 2 is to pick up all 19 red fruits (for a total of 20 LocoRoco in all) per level, and that is no simple task. Every level has secret passages and areas that are masked well with subtle hints giving away their locations such as a slight curve in an otherwise straight wall. You're not entirely safe and sound either as there's plenty of perils to worry about such as spiked walls and shadowy Moja minions that will put one of your critters in danger of death if not rescued. Some levels can be infuriating trying to collect and maintain all 20 LocoRoco without losing one of the helpless little buggers. 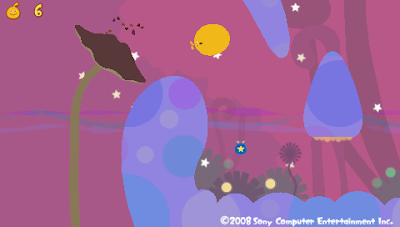 In this aspect, red fruits are your lifeline in LocoRoco 2. Not only does gobbling these glorious goodies give you a bigger blob, but it also allows you access to some items located in levels. Only having a select number of LocoRoco at these level sections lets the LocoRoco perform in a quick rhythm mini-game for the locked-up prize where you need to press the circle button as the circle goes over a note on the screen. 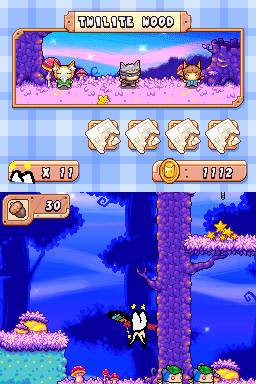 The rewards from these games range from musical notes that when 100 are collected give the player a level bonus like spike-protection and a map of the level to blue bugs that give prizes. rainbow can eat your LocoRoco! These prizes are construction pieces that are designed to help build additions to the Muimui house, the most elaborate extra in LocoRoco 2. Building new rooms and expansions for the ever-increasing amount of saved Muimui-- which there are three waiting to be rescued in every level-- occupants can lead to marvelous extras as well as four bonus levels required for completing the game 100%. Other mini-games include a whack-a-mole game, LocoRoco-style, Loco Race where you bet on the LocoRoco that will win the race, and Loco Rider, an event where the aim is to knock your opponents into submission... a set of spikes. Boss battles round out LocoRoco 2 pitting everyone's favorite singing blobs against one of the commanders of the Moja army. These battles are epic in scale, and they give some more variety to the game. This is how big and busy your Muimui house can become. 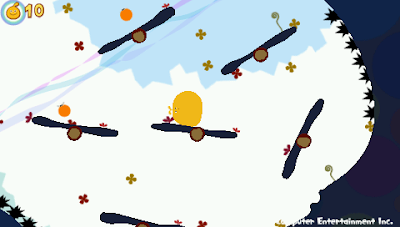 LocoRoco 2 has a very simple but effective art style. The game is bright and vibrant, and every little background and character is full of immense cutesy charm. Objects and plant-life in the background bounce up and down in a jaunty display, flower petals stream down, and creature design is full of simple allure. Certain cut-scenes are just downright hilarious even without any use of dialogue whatsoever. The soundtrack is an eclectic mix of original music, but most of which is just remixed from the original LocoRoco. For those not into the quirky, you may have some reservations with the music as something similar to Alvin and the Chipmunks may not be very appealing. Otherwise, you'll either love it, hate it, or have it grow on you like an infectious rash that you can't help but enjoy scratching. The music is interactive, too. In each level, once your ball of LocoRoco reaches ten occupants, the music will add a layer to the song of the LocoRoco singing along. They'd sing to their graves, I tell you. LocoRoco ball applies its weight to them. LocoRoco 2 is an incredibly worthy addition to anyone's PSP library. For those who enjoy the journey, there's 25+ hours of content to plow through before all is said and done. While the difficulty to complete each level from start to finish isn't very large, trying to achieve the best ending LocoRoco 2 has to offer is a far greater challenge as some of the bonus levels are just ridiculously cruel. Add all that to the lovably low twenty dollar price point, and anyone with just a hint of curiosity towards LocoRoco 2 has no excuse to ignore this pleasing and well-put together package. The Nintendo DS may very well be the system of this console cycle. At first, it was a rocky start with a drought of quality content for around eight months. Sure, there were beams of light penetrating through the darkness at the time like Meteos and Kirby Canvas Curse, but for the most part, new DS owners were clamoring for more content. Now it seems it's the exact opposite for DS owners, and don't get me wrong-- that's a good thing! There seems to be too many great games and not enough time to enjoy them all. Of course, this means that a lot of titles fall under the radar into obscurity except for those who took a gamble and picked them up. The following is a short list of games that you may not have played, but they're very much worth the time to check them out. I haven't listed every overlooked DS game, but I have compiled a list of some of my unsung favorites. 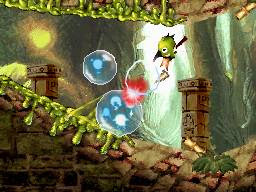 Seeing that Jungle Climber's predecessor, DK King of Swing (GBA), didn't get that big of a fanfare on release or after, it didn't seem that Nintendo would bother greenlighting a sequel. I was very pleased to see the opposite. 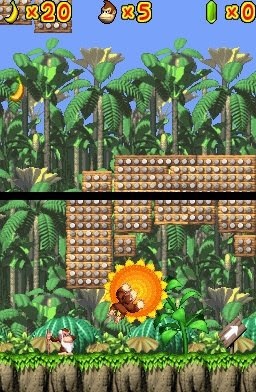 Those longing for the Donkey Kong Country days of old will find that DK Jungle Climber shares many similarities with the SNES trilogy even though how the game is played is entirely different. Leaping into the air, grabbing pegs, swinging around, bashing enemies, collecting KONG letters, and discovering hidden bonus barrels, DK Jungle Climber has/is a barrel of fun. I know the characters and most of the legend behind the Dragon Ball franchise, but I'm not really a fan of the show. 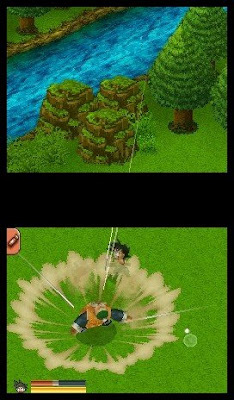 Even if you have no knowledge of the series, Dragon Ball Origins is an excellent action-adventure game borrowing a lot from The Legend of Zelda: Phantom Hourglass-- at least control-wise. Origins is oftentimes hilarious in its cut-scenes, the character models are some of the DS's best 3D, the action is seldom slow, and it all adds up to an experience even a Dragon Ball critic can enjoy. I believe this title didn't do so hot as Capcom really murdered their own franchise, running it into the ground. You had the superb original on Gamecube (later ported to the Playstation 2), and then the sequel came out a year or so later. Then Capcom opted to release an ill-conceived Smash Bros. clone party game, and by the end of this, many were tired of the franchise. 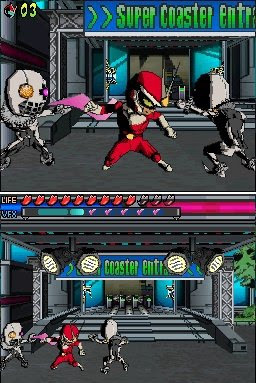 Regardless, Viewtiful Joe: Double Trouble is a very competent and enjoyable romp. 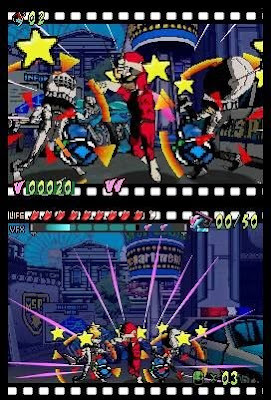 While only two enemies can be on-screen at the same time, the humor and charm of the series is still present as well as new V-powers taking advantage of the DS' dual screens. A fun game for a franchise that I wish would return to its former excellence. Those old-school gamers or just gamers who love their daily dose of shoot-em-up action have a bounty of arcade sweetness with the Nanostray series. Made by the fine folks who made the Iridion line of Game Boy Advance titles, Nanostray is a top-down shooter with brilliant and impressive visuals and presentation. That's just the icing though for the actual cake-- fantastic gameplay that can be tough as nails at parts. 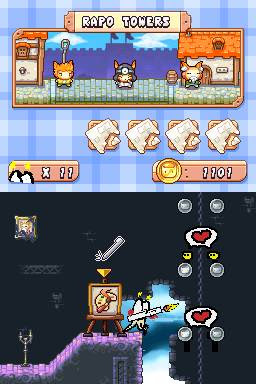 Nanostray 2 stayed true to its roots, but it also brought a new side-view in some levels akin to the old arcade classic, Defender. The best part of the Nanostray series is that you don't need to waste any quarters once you die-- which you will-- a lot. While the level design and platforming action were pretty much run-of-the-mill, the main draw to this creative title was the ability to doodle in your own character and creations. Your hero was whoever you drew him, her, or it to be in Drawn to Life. Not only did you create the character, but you also drew various environmental objects. Can't cross that large chasm? Draw a bridge! Need to plunder the watery depths? Draw a submarine! Even if you have little artistic talent and can only draw eggs for everything, it was very cool as well as hilarious seeing your creations come to life in Drawn to Life's virtual world. 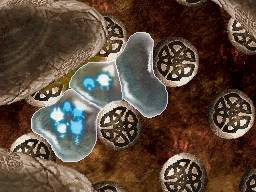 Destined to be overlooked as it was originally only available at Toys 'R' Us, Soul Bubbles is the type of game that only something like the DS could do. The premise is simple: use the stylus to blow your bubble through a labyrinth of caverns and challenges, uncovering level-unlocking goodies, on the way to the goal. This isn't really a game that will make you sink three hours into before realizing it, but it is a wonderfully unique idea that is executed rather well to make a thoroughly enjoyable game. That's the list for now, but already we're seeing more overlooked Nintendo DS games. We're seeing little applause for Henry Hatsworth in the Puzzling Adventure, Elebits: The Adventures of Zero and Kai, Moon, and many more. That doesn't mean they won't sell well, however, but it does mean that there may be many DS titles that you don't even know are great. Perhaps now is the time to check back on the DS library and see those overlooked treasures in there! I really like both handhelds-- possibly more than the consoles this generation. We're just getting a bevy of great content churned out weekly now it seems. 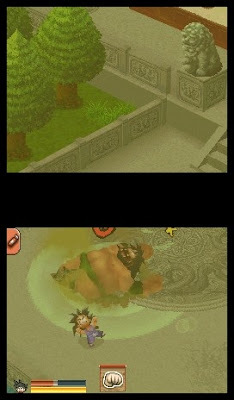 Here's a sample of that great content with Henry Hatsworth in the Puzzling Adventure for the Nintendo DS. For those interested in hearing the full soundtrack, you can download it for free in its entirety from EA's web page for the game. Hats Off to Henry. Good Show! Laurel and Hardy. Mario and Luigi. Peanut butter and jelly. Bugs Bunny and cross-dressing. All of these pairs go together well, but the platforming genre and the puzzle genre? We've seen how the puzzle genre works with role-playing thanks to Puzzle Quest, and that worked well. However, not just any genres can be combined just for the fun of it. It has to work. There has to be a cohesive and entertaining experience. Thankfully and for the most part, Henry Hatsworth in the Puzzling Adventure is just that, and I do think a "bravo" is in order. As you play, the bottom blocks keep rising. It can get tedious stopping the platforming just to play the puzzle. 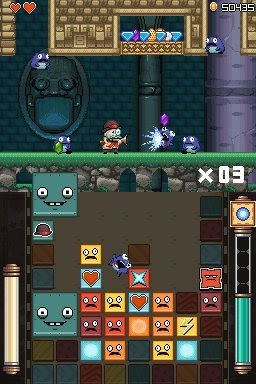 Henry Hatsworth in the Puzzling Adventure is a mishmash of two different genres. 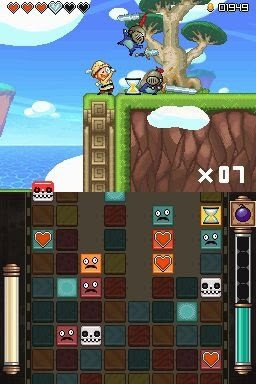 There's the 2D side-scrolling platforming that 8 and 16 bit fans have grown to know and love, but there's also puzzle elements. While the top screen shows all of the jumping action, the touch screen is relegated to puzzles. There's an ever-rising stack of blocks on the bottom screen of varying colors. It's the same premise as Tetris Attack or anything else of the Panel de Pon/Puzzle League franchise. You control a cursor that can hover over any two horizontally adjacent blocks at a time. You can shuffle the position of any two of these blocks as you try to move three or more blocks of the same color together in a horizontal or vertical line. 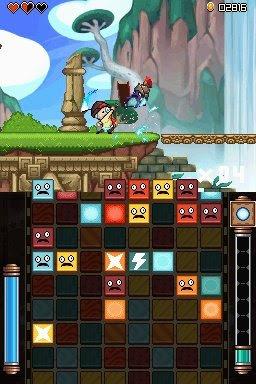 Enemies that are defeated will enter the puzzle as a colored block. Pay attention and work fast because any of these blocks that reach the top screen, and they will become an obstacle that will either try to attack or just give Henry another opportunity to lay ye olde smack-down all over again. 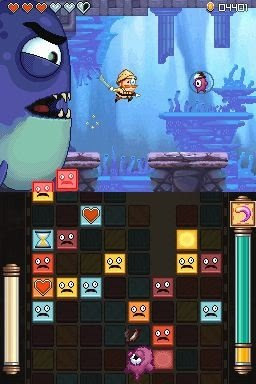 Different enemies turn into different kinds of puzzle blocks. Some need to be dealt with immediately as they'll make the bottom screen blocks rise at a frenzied pace whereas others will be 2x2 or immovable. Each time you enter the puzzle on the bottom screen, the action on top comes to a halt, so there's no frantic or frustrating multitasking to worry about. Big fish in a big pond chasing a bigwig big time. There's also certain occasions where Henry will come across a single or series of dotted line blocks. By matching a set of blocks in the puzzle, these blocks will turn solid for Henry to jump or climb upon. Sometimes they'll just be used to block a hazard or make a section of a level easier to manage. As cool and as novel a concept as all of this is, I would have honestly preferred to see that matching blocks to benefit Henry in the platforming world would have been used much more and in much more impressive fashion. Perhaps there was a giant ice cube halting Henry's path in a level, and you had to match a series of red blocks on the bottom screen to make the cube melt on the top screen. Ideas like that-that would make Henry Hatsworth shine even more and not seem like a missed opportunity in some regards. as well as one hell of a golf swing. Although the platforming action of Henry Hatsworth won't have people shouting from the rooftops that it's revolutionary or anything of that sort, it is a very cohesive and enjoyable experience. Henry himself controls very tightly. At the start of the game, he has a meager amount of moves and abilities to his arsenal-- some sword swipes in different directions for different occasions and a small amount of health. As he collects pieces of the golden suit, Hatsworth gains new abilities that allow levels already beaten to get a new life with them-- especially since many of them have easy-to-miss alcoves for treasure and hidden exits leading to extremely challenging secret levels. 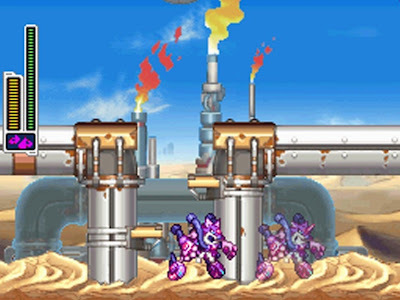 These abilities include the power to scale up walls-- Mega Man X-style, to being able to breathe underwater. While the first world isn't too much to write home about as it's rather ho-hum, mundane, and uninspired, later levels and worlds are filled to the brim with masochistic enemy placement, precision-based plaforming, wonderful concepts like a world based on the puzzle format in which the game is based on, and a high-- nay-- very high challenge. Those thinking that Henry Hatsworth in the Puzzling Adventure sounds like a breeze will get a very rude awakening. This game can be mighty difficult. The fact that the only checkpoints in the game come once you leave one area to another, and you can be playing for fifteen minutes, die, and have nothing to show for your work. 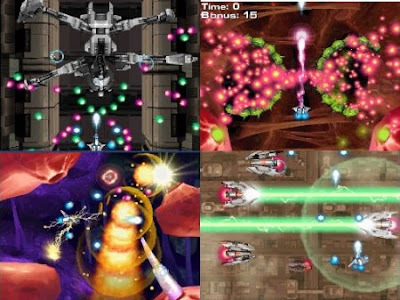 The bosses are a blast to play-- very creative, some of which even use the bottom screen in cool ways-- but they, too, can be incredibly challenging to players even after the boss pattern has been learned. Some aspects of the level design in Henry Hatsworth that I didn't really enjoy were the multitude of ambush rooms. These are rooms where Henry has to take down a march of minions before being able to move on. While these rooms are essentially designed to take advantage of the Tea Time power, they're far too abundant throughout the game and just come off as a cheap way of stretching the longevity. This wasn't really needed either as the Puzzling Adventure takes a fair amount of time to complete. Perhaps ten hours or more to reach 100%, and that's not including any subsequent playthroughs. Furthermore, there's no ability to return to a room or area you just left. You have the start the whole level over again. This isn't so much a problem about not being able to backtrack for missing treasure as it's more of a problem with being screwed. If you enter an area where you don't have the necessary ability to survive, such as being able to breathe underwater, and you can't return to the room you were on because you didn't know any better, then you have to start that entire level over or continue to die over and over again. Note to self: if you wear a suit underwater, you can breathe. too often in most worlds. 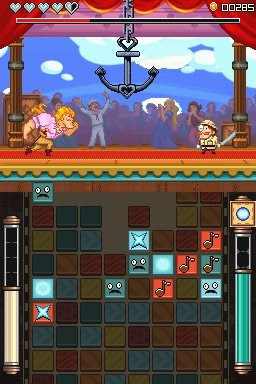 Henry Hatsworth is a magnificently charming game, and that's not only due to the cast of kooky characters and setting. It's due to the very nice presentation. Character voices are acted much in the same way as Banjo-Kazooie through colorful gibberish. (You know when I have to mention Mega Man X and Banjo-Kazooie in one review, the game must be good.) The soundtrack is very melodic-driven which is rare usually for a Western-developed game. The songs are relatively catchy, songs like the second world's final boss are technologically impressive as well just awesome, and the music really adds an extra dimension to the game. Don't be surprised if you find yourself unknowingly bopping your head to a tune. The art style is terrific as well, The colors are vibrant, the graphical touches are subtle on their own, but the entire package is fantastic. Listen to the song I'm referring to here. 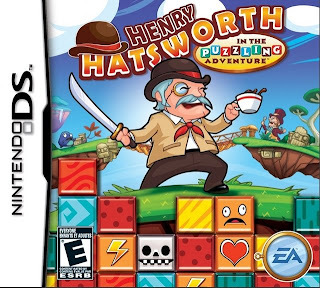 Henry Hatsworth in the Puzzling Adventure may very well be another game those goes under the radar of many DS owners. I can't say that-that can be blamed as the bounty of worthwhile titles for portable gaming is immense. However, for thirty bucks, there's definitely no reason why 2D fans of Mario and the like shouldn't shell out the cash for this entertaining quest from EA who isn't necessarily known for these quirky-themed games. Forget the golden suit-- Henry Hatsworth in the Puzzling Adventure is the true treasure here. For new content this week, I have two brand-new reviews for Tuesday and Wednesday respectively as well as two articles examining some of the overlooked titles of the DS and PSP libraries. In the meantime, it's time for Donkey Kong to once again get his well-earned day in the sun with SuperPhillip's Favorite VGMs! Out of all three Donkey Kong Country games, Donkey Kong Country 3 has my least favorite songs. There's nothing completely awful here, but there's also not a lot that's truly memorable. Frosty Frolic is one of those catchy, memorable songs. Let's shift into 3D with Donkey Kong 64. This game had a magnificent presentation and fun worlds to explore. The major problem with the game, however, is that essentially everything is necessary to collect in order to advance to the end of the game. DK 64 swiftly grows overwhelming to most players. This rhythmically sweet song plays during the first world of the game, Jungle Japes. "I don't want to work. I just want to bang on the drum all day." Or in this case, the bongos. Donkey Kong: Jungle Beat is one of my favorite Gamecube games, and the team behind it went on to their next project, a little old game called Super Mario Galaxy. Hence why the composer is the same talented fellow. A Wii port of the Gamecube game with remixed, remastered, and new levels will be hitting Western territories sometime in the near future. DK King of Swing is a severely underrated GBA game. It and its DS sequel, Jungle Climber, both loosely follow the old DKC formula. 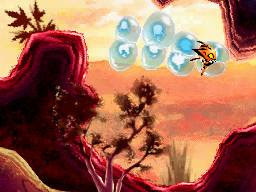 Only this time levels scroll up and a climbing mechanic is the main form of gameplay. The soundtrack while not atmospheric or as good as the DKC series still has some great tracks such as this one for the cave levels. Did the majority of people who played this game have shoddy controls or something? 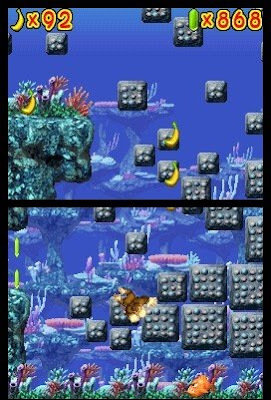 While this game was just a shade about average, Donkey Kong Barrel Blast by no means had broken controls. Going into what this series of videos is all about, the soundtrack is lively, upbeat, bouncy, and it gets you pumped and primed for the races to come! Donkey Kong's heading back to the jungle for now. Next week we explore the songs accompanying a prince who rolls a giant ball around. Hm.. What could that series be? Find out next week!